Midsummer is only a few sunrises away. 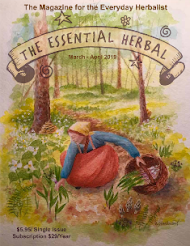 After a terminally gray winter and an unpredictable spring, I am as eager as a honey bee to begin harvesting herbs and flowers. In just a few weeks my favorite herb flower, Calendula, will be hard to keep up with. I celebrate using the last of my stash of dried Calendula to make Calendula Castile soap. I make this soap in honor of the summer solstice every year. Castile soap has a reputation for being “difficult” but I have never had a failed batch. It is a mild soap, gentle enough for use on toddlers. 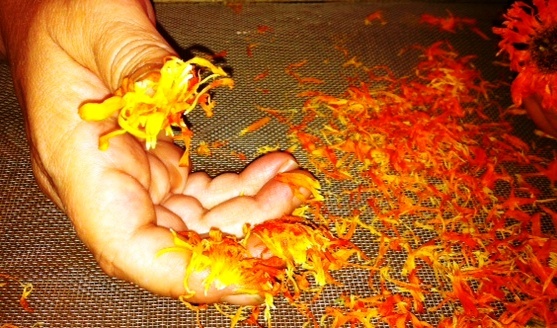 The Calendula petals add a beautiful, random play of color to cold process soap. Even the heat of the gel process will not fade their color. Calendula is considered a solar plant because the petals open to face the sun when the sun is out, and close up slightly towards evening or on cloudy days. Full-on, all day sun is just what Calendula needs to thrive. I am up with the birds every day during the growing season, dead heading our Calendula plants. 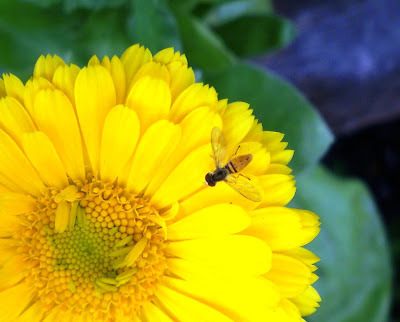 If you are growing Calendula for the first time this year, know that every one of the prolific open blooms must be picked at least every other day, or they will quickly go to seed. However, you’ll find that Calendula is well worth the trouble. 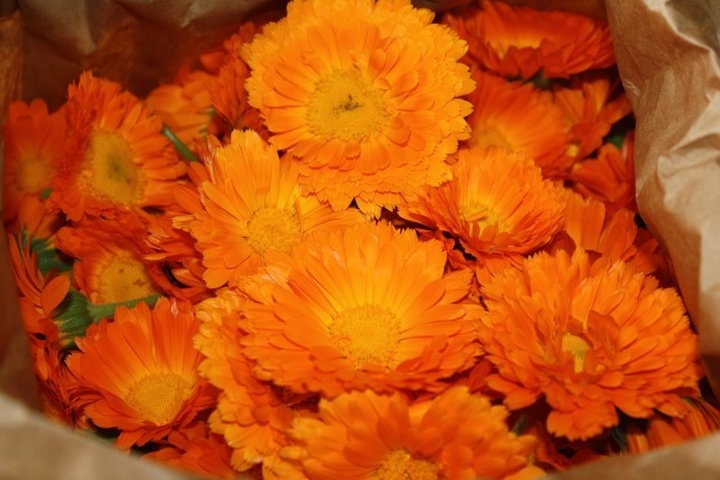 Calendula has been loved by herbalists through the centuries as a remedy for wounds and skin conditions. It has anti-inflammatory properties and resolves bruising beneath the skin. 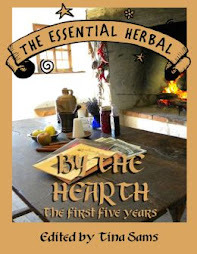 Aerial parts of the plant, tinctured, are excellent first aid for wounds, preventing infection and hastening healing. The dried petals, prepared with boiling water as a tea (and cooled), are a first rate wound wash, and soothing to scalds. Creams made with Calendula oil soften the skin, soothing eczema and helping to keep the skin nourished and supple. Calendula makes a beautiful, soothing salve for chapped hands, nicks or scrapes. NOTE! If you see something resembling worm larvae in either the finished oil or soap, it is most likely just a Calendula seed! Simply lift it out with tweezers or a spoon. 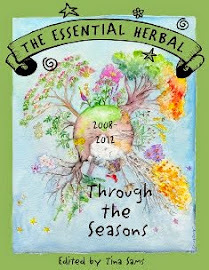 It is easy to inadvertently pull a seed off the head when you are removing the petals. 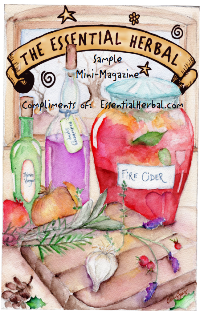 I found several the first time I made the infused oil. The seeds are a somewhat curly, crescent moon shape. TO INTENSIFY OIL COLOR: Annatto Seed (Achiote Seed) is a natural colorant that can give your soap a gorgeous yellow-orange color, just like cheese or butter. For a light to medium yellow, heat Annatto Seed and Olive Oil 1:4 in the crock pot or on low heat on the stove burner. Upping the ratio of seed to oil will deepen the color. What appears to be a yellow colored oil may turn to more of an orange color once the soap has been processed in the mold, especially if you allow it to gel. For some reason, Annatto oil turns darker in soap that has gelled than in soap that hasn’t. 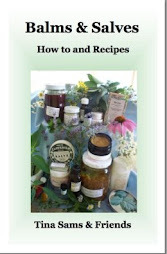 If you don’t allow your soap to gel, keep the Annatto seed to oil ratio on the light side. Too much Annatto will bleed out into the lather as the soap is used. Need an easy, go to idea for drinks or cocktails that is tasty, simple to make, freezes well? 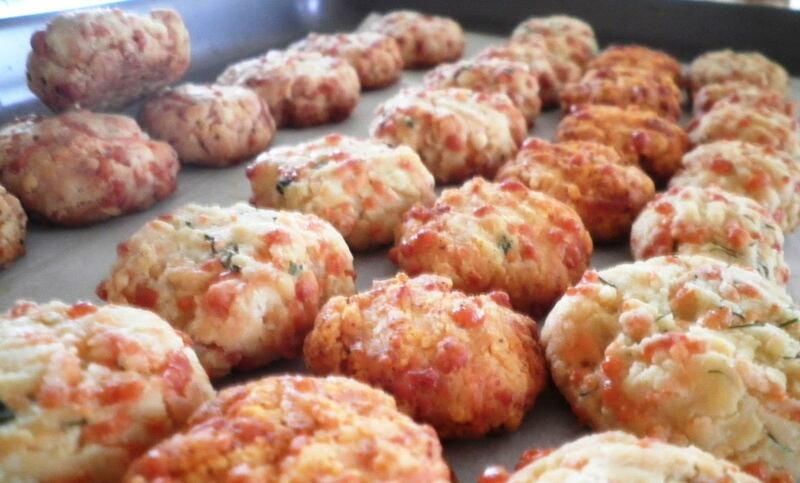 Why not try herbal cheese cookies. On the spur of the moment a friend asked me to bring a "nibble" for drinks before dinner, nothing too heavy. I trolled the Internet for a minute or two and decided on making these ultra simple cheese cookies but I also planned to "herb them up" a bit for added flavor. 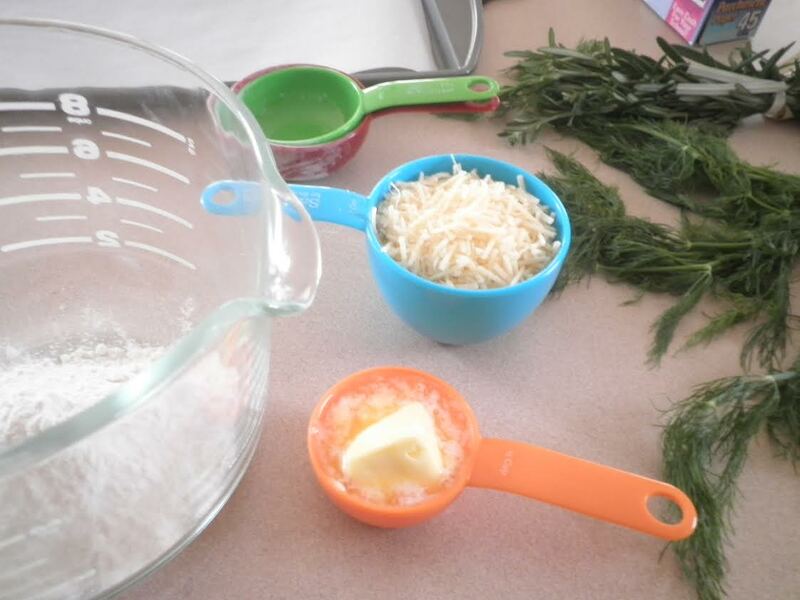 Mix the butter, flour, cheese and thyme, if using. 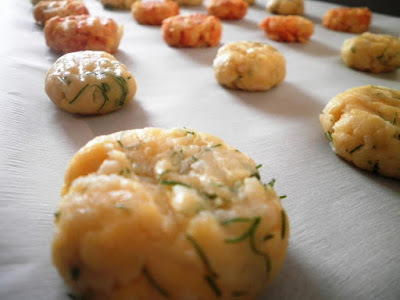 Form into small balls and place on a cookie sheet. Add the fresh herb if you are using them now. Chill these for one hour then bake in preheated 400 oven 15-20 minutes. Cool or serve warm or freeze and warm as needed. 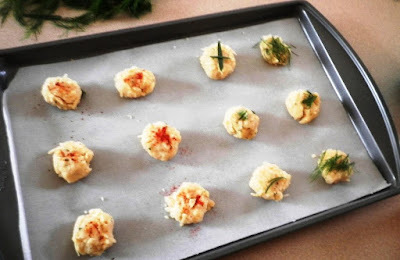 Make a batch of these and store in the freezer, reheat in 400 oven five to seven minutes. Nice to have on hand and a clever take on cheese and crackers. I made these exactly as listed and they're great. We're big soup eaters around here, and breaking one or two of these over the top of the bowl is wonderful! Same goes with a good salad, and for a smaller family, making these and freezing them means that there's always some great cheesy garnish around. I also *had* to play with the recipe, because I'm wired that way. Adding one egg and a little more flour (1/4 c) turned these into something like a super cheesy oyster cracker. I love them both!